Jean-Marie Leclair (1697-1764) is French late Baroque composer, often credited as the founder of the French school of violin playing, having bringing it back from Italy. His French training as a dancer allowed him to find employment in Italy, where he quickly decided to study the violin with Giovanni Battista Somis, a student of Corelli. Leclair's adoption of Italian music is evident in his published 13 opuses during his life, where 10 of these are in the Italian sonatas or concertos. Only his two Récréation de musique, op.6 and op.8 and his opera Scylla et Glaucus, op.11 are of true French form. Leclair's violin music poses considerable difficulties to play. He introduced the use of double-stopping into French violin music, and it is featured a fair amount throughout his music. 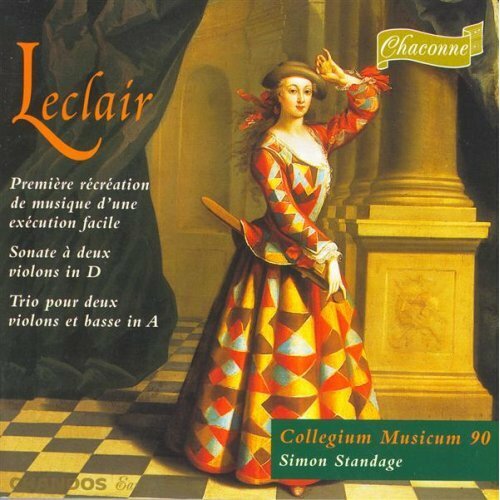 However, Leclair's music exhibits the grace and elegance of French music, and thus can sound deceivingly simple. In one occasion, when he was to perform alongside Locatelli, an audience state that Leclair "played like an angel" and Locatelli "played like a devil." As a musician trying to make a living, Leclair did not completely give up the amateur market. He published two opuses of Récréation de musique, as mentioned early. Not only did these adhere to his French origins, they also demand less from the performer. The same is for his posthumous work op.14, a trio sonata for two violins and bass in a French suite fashion. The two pieces recorded here are the first Récréation, op.6 and the op.14 trio, in addition to another sonata for two solo violins, a piece with considerably more challenge. The two suites open with a French overture and progresses with a series of dances, before both ending with a Chaconne, although much different in nature. The op.6 Chaconne is more refined, while the one is op.14 is more outgoing, evident in just the first few bars. The music is played nicely by Simon Standage and his Collegium Musicum 90. Simon Standage was a founding member of The English Concert, where his recording of Vivaldi's Four Seasons was a landmark recording of its time, using period instruments. Collegium Musicum 90 and Simon Standage give a very "British" rendering of the pieces. You won't find fire in their music, but you get consistent and solid music-making. Some of the dance movements could have used a bit more liveliness and direction, but maybe they were staying true to Leclair's directions to play it "easy and light." Nonetheless, the real saving grace for me are the Chaconnes, where their performance style is convincing. In the end, I am happy that Standage endeavors into the relatively unknown to provide for some good music to see the light. When we compare the op. 3 work with a much more recent recording by Florian Deuter, the differences in playing style are quite evident. This disc is far better than Standage's sonatas with Nick Parle on harpsichord. Leclair's interesting music for me makes this recording sing; the second violin (presumably the late Micaela Comberti on this disc) is the one that feels like it's pulling down the energy with a slightly labored technique and spongy sound. Among CM90s Leclair, the concerto discs were better. Yes, I have those CM90 Leclair concertos as well, a good job done by Standage, as the pieces are challenging in their own right. I didn't bring up that op.3 work in the review here, but this recording is already more interesting than the Holloway + Banchini recording I own. Besides a very dry sound, the playing is also quite lackluster to my taste. I listened to clips of the Deuter recording, and it is indeed the more exciting new style we have come to be accustomed to.